Another game, another goal for Romelu Lukaku. Having got home after watching my beloved West Bromwich Albion and more specifically Chelsea loanee Romelu Lukaku for the umpteenth time this season it is same old, same old. Another menacing and marauding display from the beastly Belgian with a goal to boot, taking his tally in the league to an impressive 13 goals in 26 appearance, a goal every two games. Lukaku was a constant menace to the Swansea defence and proved an incredibly difficult adversary for Ashley Williams and Co. in the Swans back line. His aerial presence, strength and electric pace is at times an almost impossible for opposition defences to deal with, and so it proved this Saturday with Lukaku picking up a well taken goal as well as leaving the Swansea defence in tatters at times. Remarkably, this wasn’t even one of his standout performances in my opinion. Albion fans need only cast their minds back to January 12 at the Madejski Stadium, where despite being on the losing side Lukaku put in perhaps the best performance that I have ever seen a centre forward put in as a football supporter. Quick, agile, strong and frankly too much to handle for the Reading back line. Lukaku stampeded through the Reading back-line time and time again, hitting the woodwork twice as well as scoring two goals, the second a particular highlight, as he picked up the ball on the halfway line, rampaged into the opposition half before rattling home a 25-year effort past the despairing Adam Federici. It was this day that I truly realised the potential of this young Belgian. Lukaku’s talent was clear to see from day one. In his debut season in the Belgian Jupiler league- at the age of just 16, he top scored in the division. Although he had arguably the strongest attack behind him in a relatively poor division, any youngster who can top score at that age clearly has something going their way. Lukaku was promptly snapped up in a big money move by Chelsea but suffered last season as he spent much time languishing in the reserves squad, a “wasted season” as he called it. Some suggested his growth had been stunted. He has slammed any doubters senseless so far this season after joined West Brom on-loan for the season. 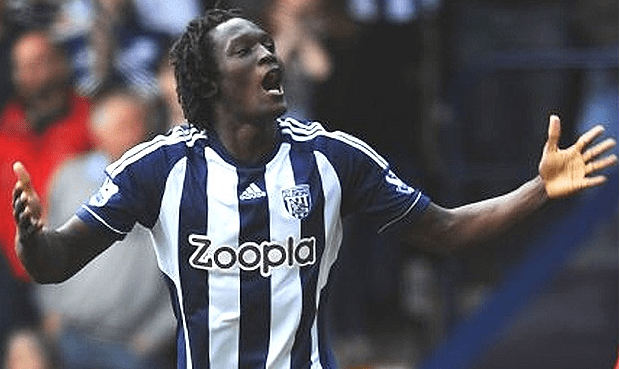 I for one must admit to being somewhat of a “Lukaku cynic” in his early West Bromwich Albion tenure. Despite a blistering Albion debut against Liverpool (a particular highlight being when he left a hapless Jamie Carragher on the seat of his pants after a nutmeg) his early games showed Lukaku to be a youngster lacking in game experience slightly out of his depth in the Premier League. His talent was always there for all to see, but at the start of his loan spell it was shown in an all too sporadic nature, typical of a man who had made only one league appearance the previous year. His touch was that bit too elusive, his finishing just not as clinical as you would hope- but as the ex-Anderlecht star has accumulated more games under his belt, his stature has grown literally on a game by game basis. Where he may have lost out in a challenge to a defender before, now he just seems that inch sharper. Where he may have scuffed an effort wide before, you would bet your mortgage on him scoring any chance that comes his way now. The progress from him being an incredibly raw talent to being a honed and dangerous hitman has been astonishing. And what we must remember. He is still only 19. Lukaku has already evolved into one of the most dangerous striker’s in division in just the seven or so months he has spent at Albion this season- so it does make you wonder. Is the sky the limit for this rising hotshot? Having watched and analysed his performance week in, week out so far this season I would argue that Romelu Lukaku could become the best in the world at what he does. Whilst comparisons like the one I am about to make are somewhat resented by the Belgian, it is hard not to make them. At his peak, there was no other player in the world that could offer what Didier Drogba could. A brutal mixture of physicality, pace, power and sublime skill that was basically unhandleable for opposition defenders. It is undeniable that on his day that Drogba was simply the best in the world as a powerhouse centre forward and I would argue that Lukaku could surpass Drogba’s ability. The technical ability and physical attributes of Lukaku at his tender age are scary, and he is now undoubtedly one of the most feared attacking forces in the country. Lukaku’s attitude is quite remarkable for a player of his age – no late night clubbing or partying and a personal integrity (no greater display of this than him refusing to take a Champions League Medal for Chelsea last season as he felt he didn’t contribute enough) means that he is the consumate professional. His unassuming but driven nature can only help his development as a young player, and with the right and most astute coaching methods (as shown by Steve Clarke this season) he can come on leaps and bounds. Perhaps this is just me being a selfish supporter, but I feel another season out on loan would help Lukaku. At Chelsea he risks being lost in the tides of Ba and Torres (especially if another big name striker comes in in the summer) and as proven so far this term exposure to football is what this youngster needs. When given the time and support- the results you get from this scarily talented Belgian are quite something. Whilst some questioned the price tag of €18m on his head I can see more and more that Chelsea’s investment is more than justified. What they have on their hands here is a boy who can genuinely become one of the best in the world. With his pace, strength and marauding game style, I firmly believe that like Didier Drogba before him, Romelu Lukaku can sky-rocket himself, and Chelsea to the top. Chelsea management more than any other person or body should read this article and do some positive in the interest of both the player and the club.